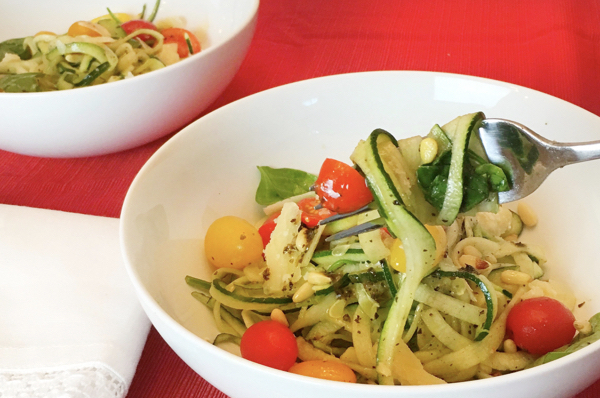 Substitute pasta for zucchini noodles and reduce calories, carbohydrates and sugar but still enjoy all the delicious Mediterranean flavors that most of us crave in Italian dishes. You can serve this as a vegetarian meal or a side dish paired with grilled chicken, either way, it is absolutely delicious. This recipe is in The Hollywood Trainer Club with over 150 more healthy delicious recipes and weekly meal plans. Log into the club TheHollywoodTrainerClub.com click Meals, then Recipes A-Z , then type in Pesto Zucchini Noodles with Cannellini Beans. Add 1 tablespoon olive oil, 1 clove chopped garlic and Cannellini beans into a deep skillet , sauté on medium to high heat for 4 minutes. Add heirloom tomatoes and chopped basil continue to sauté for an additional 3 minutes. Turn heat down to medium, add spinach, remaining olive oil and garlic into skillet cook for another 3 to 5 minutes. Toss zucchini noodles and pine nuts into skillet and continue cooking for another 3 to 4 minutes. Top with Parmigiano Reggiano cheese, salt and pepper to taste. * Optional, add a dash of red crushed peppers if you want an spicer flavor.